Orthodontics is the branch of dentistry that specialises in the diagnosis, prevention and treatment of dental and facial irregularities. Orthodontic treatment involves the use of corrective appliances to bring the teeth and jaws into proper alignment. An orthodontist has been specifically trained, and is the most qualified in the diagnosis, prevention and treatment of problems associated with the alignment of the teeth and jaws. It is recommended by the Australian Society of Orthodontists that a child be assessed by an orthodontist as the adult front teeth erupt. This is usually around age of 7. 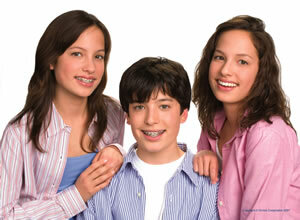 Successful orthodontic treatment can be performed at any age. At Doncaster Orthodontics we offer various aesthetic options including ceramic braces and Invisalign clear aligners. Brackets: These are metal or clear attachments which are bonded or 'stuck' on to the teeth. Brackets can be considered the 'handles' of the braces, to which the wires attach. At Doncaster Orthodontics, we use self-ligating, friction-free brackets that are at the cutting edge of orthodontic technology. Wires: The arch wires are attached onto the brackets. At the beginning of treatment, gentle pressure from the arch wires commences the alignment process. As treatment progresses, the arch wires become thicker and stronger. Rubber bands: Most patients will wear rubber bands at some time during their treatment. Rubber bands place forces on specific teeth and the jaws to move them into an ideal position. It is important that the rubber bands are worn as instructed to ensure a beautiful result. Bands: These are metal rings that are placed around the back molars. They provide support for the wires. Invisalign is the nearly invisible way to straighten teeth using a series of custom-made, nearly undetectable aligners. The fact that the aligners are removable means that you can easily maintain good oral hygiene and there is no impact on what you can eat and drink. Invisalign aligners are also more comfortable than traditional braces.